The pursuit of the California 14ers has been a wonderful enterprise. It has been an honor to climb in memory of victims of cancer whose struggle is so much harder than any of our efforts in the mountains. It has been humbling to realise how many are personally stricken and ito realise that every single one of us is affected by having friends and family members suffer. We have felt guilty that we enjoy the mountains and create great friendships through the 14 ers project. We hope that we have raised some awareness and funds toward cancer research. During the climbs both Deborah and Adrian have lost close family members to cancer. White Mountain September 2012 Full Story Celebrating our final peak with a big group. Russell and Split August 2011 Full Story Beuatiful trip with a great group and success on two peaks. Thunderbolt and Starlight July 2010 Full Story Wow, we made it from the west. Tyndal May 2010 Story of Williamson and Tyndal Photo album or another album or Pictures on Flicker Got the summit on Langley but ended up in the wrong place on Williamson and failed. Split January 2010 Story of Split in the snow Derek's video or Pictures on Flicker Snow, hills and wind. January 14th.2010 Didn't make the summit! North Pal and Polemonioum July/August 2009 Story Derek's video or Pictures on Flicker These tough peaks live up to their reputation. Summited Palisade and Polemonium on July 30th.Got back at 8am! Our attempt on Starlight and Thunderbolt from the East failed. Whitney & Muir Nov 2008 Story and pictures Pictures on Flicker or Derek Castle's video We had a great climb of Whitney by the climbers route and Muir in winter conditions on November 22nd. Made both summits and still got down before midnight! Middle Palisade Sept 2008 Story and pictures Pictures on Flicker Consistent steep climbing. Rugged talus hiking.. Camped on the ridiculous rocks of 'Thumbs Up Camp'. Struggle out tired and decide to leave Split for another trip. Sill July/August 2008 Story and pictures Pictures on Flicker Tough mountain. Fabulous views of the Palisades. August 1st summit. First to sign the summit register for 5 days. Camped at the stunningly beautiful Sam Mack meadow. Loose steep rock. Took a look at Polemonium but that will have to wait for later with its exposed slabs! Shasta Feb 2008 Story and pictures from Mt Shasta. Pictures on Flicker Long isolated climb in winter. We found great weather for a change and climbed steep snow and iced up rocks in blue sky with spindrif blowing and great views. Also, in order improve on the technical skills needed, we have had a few training trips. Thanks to Hi-Tec sports for their footwear and support. All done - at last! Adrian and Deborah made the summit of Mt. 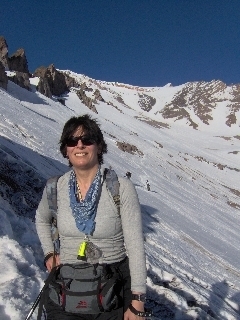 Shasta in February 2008. On the descent they decided to go for all the California mountains over 14,000 ft high. It transpired that this was a tough challenge. Deborah and Adrian decided that such a challenge merited a better reason than just 'beacuse it is there'. So they pledged to the cancer charity 'STOP Cancer'. Four years later they completed the climbs. Read their stories and supoport the charity 'STOP Cancer'. If you would like to help Adrian and Deborah reach their goal, please Donate Now at the stopcancer website. 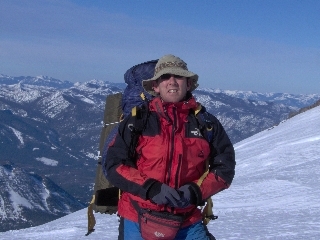 Climbing the 14ers with us is Ray Kablanow who is raising money for ' Howard Training Center'. "Thank you for allowing us to know our climb is making a difference. Your contribution to STOP CANCER.net will support important research to help find a cure for cancer and motivate us to make each summit! Adrian Crane and Deborah Steinberg"
STOP CANCER funds cancer research at UCLA/Jonsson, USC/Norris and City of Hope Comprehensive Cancer Centers, each affiliated with the National Cancer Institute (NCI) in Bethesda, Maryland. Because of its unique arrangement with each cancer center, every dollar is matched with in-kind support thereby doubling its value. In 1993 I climbed all the 14ers in Colorado, but I have climbed, run, hiked and adventure-raced in many of the most glorious places in the world. During my travels I have found people everywhere to be unfailingly kind and positive, whether it is someone from a small village in Tibet, or a large city in Kenya. After working quietly with an Arab computer programmer or negotiating with an American store owner I know that everyone wants to be fair and understanding. None of us deserve to be striken by cancer and all of us want to work together for a cure. My younger brother died of cancer and prompted me to help where I could. 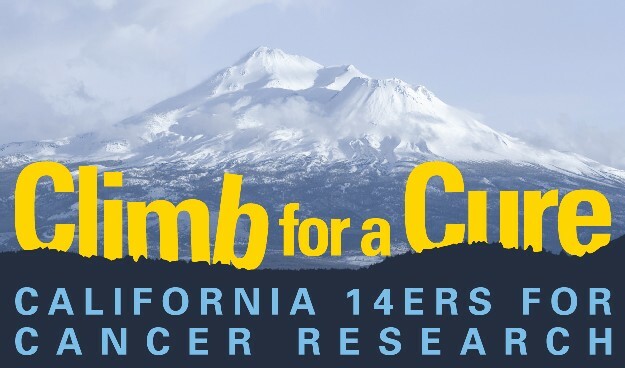 Since I do not work in biotech or medicine, I hope that these efforts in my area of expertise can help those who can directly work toward a cure. I have a wife and two sons, and we live in Modesto, California. Deborah Steinberg is an Optometrist and Girl Scout Leader in Modesto, California. She is married with two daughters. She enjoys any kind of outdoor adventure that takes her to remote, natural, quiet places, which gives her mother fits until she returns safely. Fortunately her husband, Ross Redding, is a tolerant sort of guy and enjoys the outdoors as well. To stay in shape she likes running with her dogs in the park and is able to keep up with Adrian only because she makes herself do stairmaster at the gym. Adrian is able to tolerate her because she doesnâ€™t whine too much. Her first summit of Mt. Shasta was in 2006. "Everyone knows someone whose life has been touched by cancer. We draw strength from their courage, and hope that our efforts will make a difference in finding a cure. Our wish is that each ascent brings us closer to that goal."